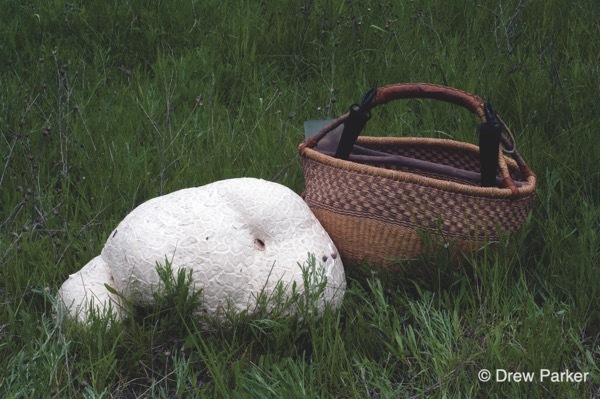 Teresa Marrone and Drew Parker, authors of our upcoming book Mushrooms of the Northwest: A Simple Guide to Common Mushrooms, share with us their knowledge of the Giant Puffball. If you want to feed wild mushrooms to a crowd, a single specimen of one of these might do the job. Puffballs consist of a fleshy spore mass that is surrounded by a thickened skin. Spore masses of the species discussed here are firm and white on young, edible specimens, turning yellow before ripening to a powdery brownish mass that explodes into the air, scattering the spores, when the skin splits or is broken (be careful not to inhale the spore cloud; it can cause respiratory distress). Western Giant Puffball (Calvatia booniana) may be almost 2 feet across at the widest point, although it is usually smaller. It may be roughly spherical, but more often is flattened and irregular. The surface is dry, smooth, and whitish at first, turning grayish and breaking up into large polygonal patches that may be flat or slightly raised. Eventually the surface becomes tan to brownish, splitting to release the powdery olive-brown spores. Western Giant Puffball is found in montane meadows or in high desert areas under sagebrush and juniper. Individual specimens are scattered but often grow in a large fairy ring. Sculptured Puffball (Calbovista subsculpta) is much smaller, typically 5 inches across or less. It is generally more spherical but may be softly folded towards the base. The surface is whitish to pale yellowish-brown and covered with 3- to 6-sided projecting pyramid-shaped warts that are up to 1⁄4-inch tall and may be flat-topped or pointed; the tops of the pyramids are generally darker than the rest of the skin. With age, the surface becomes olive-brown and splits open to release the powdery purplish-brown spores. It is found at mid- to high-elevation zones where it fruits singly—scattered or in small clusters in open conifer woods, forest edges, or areas with rocky soil, including paths and dirt roads. Good to know: Puffballs are olive-brown or purplish-brown and in season early summer through fall. The Puffballs listed here are edible when they are young and the flesh is a pure, featureless white throughout. Cut the mushroom in half from top to bottom and look at the flesh inside. If there is any trace of yellow, or any shadowy shapes within, the specimen is too mature to eat, or it may be another species. 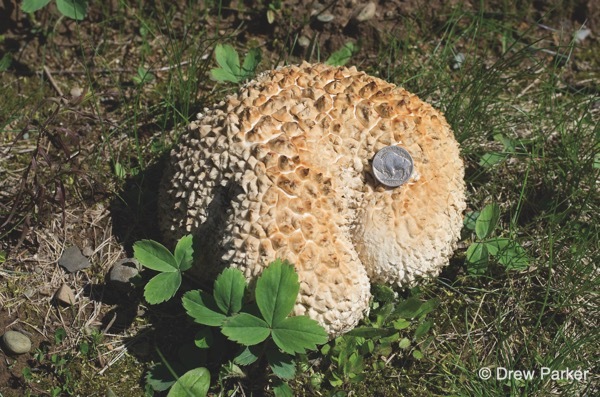 Be particularly cautious with small specimens, as they can be mistaken for a number of cap-and-stem species in the button stage, including deadly Amanitas, toxic Earthballs, or the egg stage of Stinkhorns. Puffballs may have a laxative effect on some people.